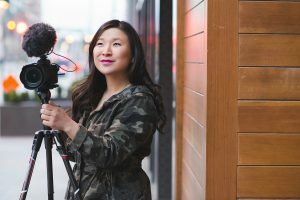 Welcome to the latest installment of Filmmaker Friday, where we celebrate members of the VIMBY nation and get to know them a little better. Here we profile longtime VIMBY vet Juliana Broste AKA “Traveling Jules”. Favorite Thing About Being A Filmmaker: I love being creative and telling stories. As a travel filmmaker, I’m lucky I get to experience some incredible places in the world. Most Treasured Piece of Gear: My Manfrotto Compact Xtreme selfie stick is a must have for important vlogger moments. I also really love my Manfrotto XPRO Monopod+ which gives me stability and flexibility so I never miss a shot. Most Important Item on Set: Pink lipstick! I can’t go anywhere without it. The most beautiful place on earth I’ve experienced is: Constantly changing. As a travel filmmaker, I’ve been lucky to capture so many interesting places on camera–like camel riding in the Sahara Desert in Morocco. Hot air ballooning in Capadoccia, Turkey. Watching the wildlife in the Serengeti, Tanzania. Snowboarding in Vail, Colorado. Just to name a few.